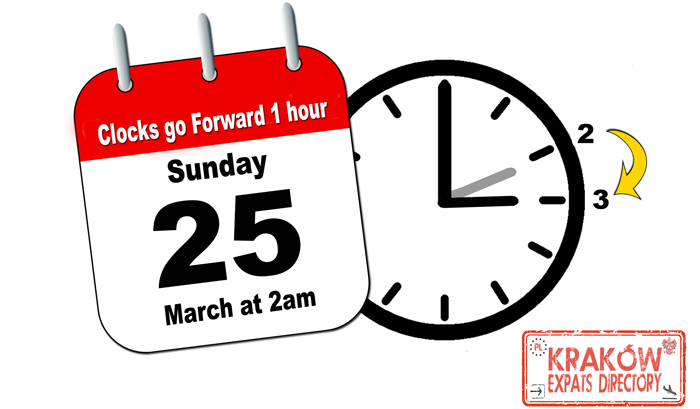 Clocks go forward on Sunday. Don’t forget to change your clocks this weekend. Daylight saving time begins at 2am on Sunday 25th March 2018, when clocks go forward one hour. Could this be the one of the last times you have to change your clocks? Poland could become the first country in the EU to scrap time changes, however EU regulations, (not to mention common sense) make this unlikely, in spite of cross party support. In October 2017 a bill to abolish time changes unanimously passed its first reading in the Polish Parliament, having had rare cross party support. Supporters of the legislation argued that the twice-yearly time changes cause health problems, damages the economy, disrupts businesses and does little to cut energy consumption. Abolishing the time change will also put Poland out of synchronisation with its EU neighbours, most importantly Germany, the country’s biggest trading partner. Poland introduced time changes during the interwar period, then in the years 1946-1949 and 1957-1964; it has been in force continuously since 1977.